CELTIC FOOTBALL Club’s Under-14 coach, Tom McCafferty has promised the Glasgow giants will return to the Foyle Cup tournament next year following a hugely successful 2015 campaign which ended in scenes of joyous celebration in Saturday’s U14 final at Brandywell Stadium. The classy ‘Hoops’ outfit netted either side of the half-time interval to see off the plucky challenge from Donegal Schoolboys in an entertaining showpiece which got the traditional finals day underway in front of a large support. And the Celtic fans in the Glentoran Stand were in fine tune prior to kick-off, treating the attendance to a rendition of Celtic anthem, ‘You’ll never walk alone,’ while the young ‘Hoops’ squad went through their pre-match huddle ritual on the pitch. Donegal keeper, Aaron Foy did his utmost to thwart the constant waves of Celtic attack during the first half, producing an outstanding point-blank save from Kieran McGrath. However, he could do nothing to prevent Hoops’ skipper David McKay from opening the scoring on 23 minutes when he rose majestically to meet Joshua Jack’s free-kick and nod the ball past Foy. And Donegal Schoolboys were stunned four minutes after the break when the alert McGrath capitalised on hesitancy in the Donegal defence and slotted low past Foy. When Celtic come over teams always want to do their best against us, particularly Irish boys, they work really hard and that’s good for our boys as well. That strike sealed the win for the Scottish club and coach, McCafferty, who completed his third Foyle Cup tournament with the U14s, was delighted to bring the silverware back to Parkhead. 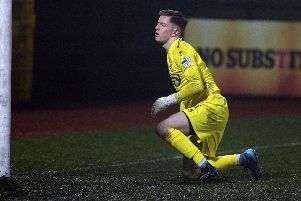 McCafferty claimed the six day festival of football was the perfect preparation for their upcoming campaign in the Scottish Reserve and Youth Development league. The Celtic coach felt the Irish teams in the tournament all raised their games against his charges in an attempt to take the scalp of the Glasgow club and he was pleased his side got to experience competitive football. “We like coming to Ireland and the boys enjoy it which is the main thing,” he added. “If they can get together and bond as a team it’s a great advantage for us. “We always come up against it. When Celtic come over teams always want to do their best against us, particularly Irish boys, they work really hard and that’s good for our boys as well. We don’t play competitive football back home, we play development football. “So to come to a competition where you know something is at stake at the end of it - it’s great for their development. he continued. “Their goalkeeper was outstanding in the first half and made point blank saves that kept them in the game. “When the score’s 1-0 coming up to half-time, a team always has a chance to get back into it. But we played well, competed well and scored another goal which we were delighted with. “I think our class shone through in the end. Their good lads and we have a few new players in the team this year so they’re still gelling as a team. So it was a worthwhile experience for the newly crowned 2015 Under-14 Hughes Insurance Foyle Cup champions and McCafferty is in no doubt the club will return to defend their title next year. Celtic: Ryan Mullen; Christopher McKenna, Ruaridh McIntyre, Jack McDowall, Andrew Kerr; Paul Kennedy (Joshua Irons), David McKay, Leon Chiwara (Brett McGuire), Joshua Jack (Michael Cunningham), Brody Patterson; Kieran McGrath..
Donegal Schoolboys: Aaron Foy; Jack Parke, Odhran McGuinness, Liam McFadden, Aidan McHugh (Kelan Nelson); Mark Walsh, Liam McFadden, Conor O’Reilly, Darragh Ellison, Ronan Gallagher; Jack Bradley Walsh.